Changing demographics bring challenges for schools and residents along the Fort Worth-Crowley border. The Sycamore Center Villa Apartments, a few blocks west of I-35 in South Fort Worth, is a nice-looking complex, with newish brick residential blocks behind a controlled-access gate, a large community center, a pool — and a big yellow sign out front prohibiting loitering and setting a sundown curfew. Hanging around on the balcony or sitting on the stairs after dark can earn residents a $50 fine. The six-year-old complex is a prime illustration of some of the social and demographic forces that are changing this part of Fort Worth. In recent years, many families have moved here from older neighborhoods in East Fort Worth, looking for better housing and lower crime rates. And some of its units are set aside as federally subsidized public housing, including 47 units for residents relocated after the Ripley Arnold housing complex in Fort Worth was torn down and the land sold to make way for the RadioShack headquarters complex. Judging by school enrollment statistics, the racial makeup of the area has changed dramatically in the last decade, as has the socioeconomic picture, and it’s been a tough adjustment process for many. The nicer, newer surroundings are a plus for some who have relocated — the streets aren’t full of potholes, and burglar bars don’t cover so many windows. 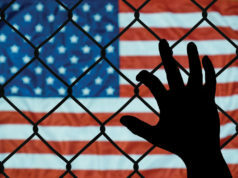 But the families who moved here to find better lives have also found that many of the social services they once counted on did not follow them. They’re farther away from jobs, daycare, and other forms of help — and dependent on a bus system that’s not always dependable. And some residents who’ve been here longer worry about a perception of increasing crime and increasing problems in local schools. Like many other moderate-income neighborhoods that once were on the cutting edge of suburbia, the area is beginning to age — and not always gracefully. Kids here go to Crowley public schools, where as recently as 2001 the poverty rate among students was about 18 percent. Now that figure is about 45 percent. In the past decade, the proportion of white students has dropped from almost 66 percent to 30 percent, and African-Americans are the largest ethnic group, with 39 percent of students. Hispanic numbers are also rapidly growing; they currently make up 25 percent of enrollment. In many ways, the once-rural district hasn’t kept up with those changes: Only about 14 percent of its teachers are black, for instance. Educational achievement measures are also dropping: The Crowley district was rated as a “recognized” district by the state education agency eight years ago; this year it was deemed “academically unacceptable,” a rating that carries the threat of a state monitor being imposed if the district doesn’t address the problems within the next year. The district is appealing the rating. “No one was prepared for [so many minority kids] to be there,” said Maura Payne-Bates, who coordinates a Tarrant County College program that’s trying to reach out to that area. The situation hasn’t gone unnoticed. The Rev. Kyev Tatum moved his ministry to Sycamore Center Villas from East Fort Worth a year ago after noticing how the population and demographics of the area had changed. Since then, he has been a driving force in getting TCC involved there, and he has pushed to bring other services to the area as well. He estimated that more than 1,000 kids live in Sycamore Center’s 280 units and another apartment building next door. “Nobody was dealing with the issues” that come with such a concentration of high-risk kids in one small area, he said. Vernice Perry moved to Sycamore Center Villas last year from the Eastchase neighborhood because rent rates were lower and her kids could go to Crowley schools. 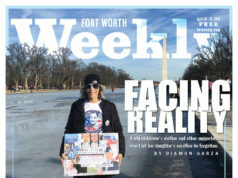 But she doesn’t think of her old part of Fort Worth as the rough side of town, and she doesn’t want her kids labeled that way. She’s convinced that her kids are getting a better education than they would have in Fort Worth schools, but she’s also concerned that the Crowley faculty and staff aren’t diverse enough — and aren’t used to dealing with kids from a variety of backgrounds. Perry’s fourth-grade son got in trouble last year in school, she said, for not immediately answering a question. He was put on in-house suspension. Perry believes the penalty was excessive for her shy son and questions why he received the same punishment as kids who were actively talking back to teachers. She thinks the Crowley schools jump too quickly to disciplinary measures and that more training in handling different kinds of kids would help. “If you don’t know how to relate to these kids, you’re not going to get their attention,” she said. Katy Cooley’s concerns about Crowley schools have more to do with academics. She and her family have lived in Crowley since 1997. Three of her children graduated from Crowley High School, and the fourth is a sophomore. The Crowley district is now rated academically unacceptable because of high dropout rates at Crowley and Summer Creek middle schools. (The district’s two high schools had dropout rates of about 10 percent in 2009, but those numbers are within the acceptable range, by TEA standards.) Low-income students had the lowest graduation rates. Crowley school board president Randall Kahan said the middle-school retention rates were miscalculated. If the TEA upholds the low rating, the district will be required to provide the agency with detailed plans for fixing the problems at the two individual schools and in the district as a whole, said Suzanne Marchman, a TEA spokeswoman. This is Crowley’s first year to be rated academically unacceptable. “It is essentially a warning sign to the district that lets them know they do have areas that need to be improved,” Marchman said. “If they’re not addressed, it could certainly mean sanctions down the road.” If Crowley is rated unacceptable for a second year in a row and has not significantly improved its graduation rates, the TEA could intervene and send in a monitor. Kahan said the district is already paying close attention to the schools and student groups that are struggling. He said that administrators will chart how Hispanic, African-American, and economically disadvantaged students are faring. If one of those populations or a particular school is struggling, the district will focus on improving curriculum and bringing in more diverse staff. But Perry said it’s not enough to bring more minority teachers and administrators to heavily minority schools. The whole district needs to diversify and retrain its staff, she believes. There are more minority-race teachers at Crowley schools with high minority populations, but the percentages are still well below those of the student bodies. Last year, according to statistics provided by the TEA, at Crowley High School, where black students make up 31 percent of the student body, seven of 98 teachers were African-American. By comparison, at North Crowley High, where blacks make up 44 percent of the students, 19 out of the 114 teachers were black. He said the teachers receive training on relating to students from different backgrounds. “We want to be culturally responsive to a diverse community,” he said. Perry said she appreciates the after-school and summer services that Tatum arranges for the children at Sycamore Center Villas, especially because the program provides them with mentors. And the children seem to respond to Tatum. He kicked off the summer program in June by bringing in TCC staff and University of North Texas students to encourage the children to finish high school and go on to college. 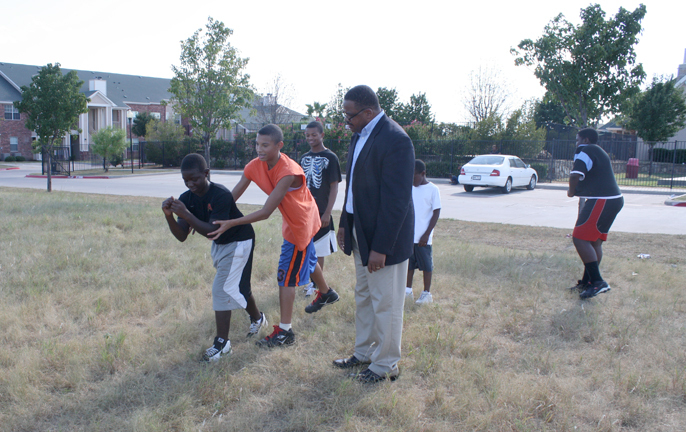 Every child who filed into the apartment complex recreation room eagerly hugged the preacher. TCC brought a Mobile-Go center to the apartments that day. The center is a trailer full of computers, on which students can learn things like internet research skills and how to fill out college applications. Payne-Bates, who is African-American, has spent a lot of time in the Sycamore Center area trying to gain people’s trust. She makes frequent trips to the apartment complex as part of TCC’s outreach, offering GED services and other educational assistance. 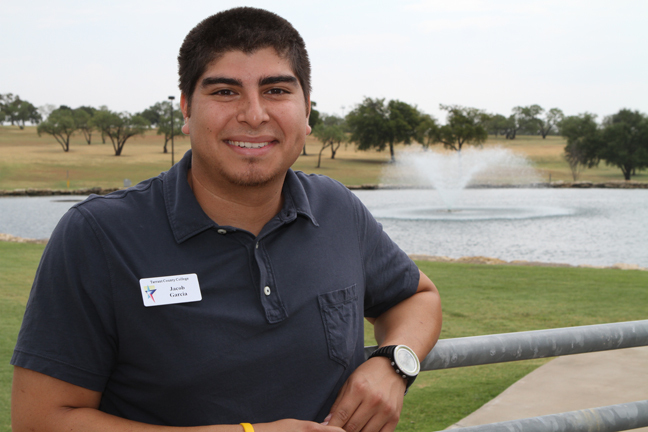 The outreach program is an effort to infiltrate tight-knit communities, like in the Sycamore Center area, where residents would not ordinarily seek help, said Jacob Garcia, with TCC’s enrollment services. “If we don’t go to them, they’re not going to come to us,” he said. Payne-Bates said students need role models from their own races. Without role models, without places to burn off their energy, she said, kids tend to get into trouble. What she does through TCC is try to offer options to a community that feels as though it has none. Tatum said his motivation is similar. He has hosted several educational programs during the summer to teach children how to apply for school, financial aid, and scholarships. The goal is to teach low-income students life skills and encourage them to go to college to escape poverty, he said. “If you get them to start thinking about going to college for real, they’ll stop engaging in activities that will prevent them from going,” he said. When the Ripley Arnold public housing project in downtown Fort Worth was demolished, the Fort Worth Housing Authority moved its former residents into apartments all across Fort Worth. The goal was to avoid concentrating low-income residents in one area, as is typical in traditional housing projects, said Alice Sykes, a housing authority spokeswoman. Sycamore Center, which opened two years after Ripley Arnold closed, was built with the help of tax credits, which meant that a portion of its units were set aside for low-income residents in federal rent-subsidy programs. Residents in those units still pay part of their rent, based on their income. But the residents who were pushed the farthest from downtown, where the housing authority office and services are located, often felt cut off from what they knew and needed. Edith Barrett, a professor at the University of Texas at Arlington, followed the Ripley Arnold diaspora for five years. She said the former residents’ feelings about the change depended in large part on where they moved. Those living south of I-20, like in Sycamore Center Villas, were the most frustrated, she said, because their children were no longer attending Fort Worth schools, and they struggled to find jobs, daycare, training, and transportation. At one point, Barrett said, the Fort Worth Transportation Authority, known as the T, discontinued a key bus route that residents of Sycamore Center used, but the FWHA was able to get the line running again. Another problem was that buses often don’t run on evenings or weekends. Barrett said a real problem for Ripley residents who were moved south was finding transportation to the Alliance Airport area, where many of Fort Worth’s new jobs were located. “They felt like they were out in the suburbs, and it was hard to find work,” she said. Barrett found in her research that many Ripley residents weren’t aware of all the services the housing authority offers, including three months of free bus passes for residents who attend GED classes downtown, start a new job, or attend vocational training courses. The downtown office also offers daycare to those attending classes there. Sykes agreed that the authority’s clients aren’t always aware of what’s available. “We offer so much, and we do so much,” she said. Tatum said the housing authority should offer many of its services in south Fort Worth, closer to Sycamore Center Villas. Because the area looks like an upscale suburb, he said, churches and volunteer groups often don’t think to offer help there. Most of Sycamore Center’s adult residents are single mothers. Payne-Bates works with a small group of those women who are trying to earn their GEDs. “They’re actually just trying to figure out a way to help themselves,” she said. The management has since backed off and is continuing to allow Tatum to offer after-school programs and counseling services. Apartment managers declined to comment for this story. One of Tatum’s other efforts has been to partner with the UNT Health Science Center to find ways to promote mental health screenings for South Fort Worth low-income residents. When there is no money for or understanding of mental health treatment, he and others said, minor problems can worsen and end up hurting kids’ chances in school and getting adults in trouble with employers and police. She has been working with Tatum to find funding to promote mental health screenings. They also hope that by offering information about mental health problems and services, the taboos surrounding such problems will fade. The bright yellow sign on the apartment complex’s front gate is a constant reminder of concerns about crime in and around Sycamore Center Villas. It reminds residents of the curfew, management’s zero-tolerance policy on loitering and disturbances, and the presence of the Fort Worth Police Department. It’s a concern that extends through much of this part of Fort Worth and into the Crowley schools. School officials and some others believe that crime worries are overblown. But the perception adds to tension in the area: Long-time residents figure it’s due in part to the influx of less affluent neighbors. However, some of the newer, low-income residents say they feel less safe in South Fort Worth than they did in their old neighborhoods. Fort Worth Police Officer Allen Speed coordinates a department-wide effort to reduce crime in apartment complexes. So far, the program has successfully cleaned up apartment communities in east Fort Worth, Speed said. He said managers at Sycamore Center Villas were invited to participate but, like others in that area, declined to join the effort. Part of the program involves managers adding a clause to leases, in which tenants agree not to commit crimes on the property, on pain of eviction. Perry said that because many residents of the apartments come from rough neighborhoods, there is a lot of “drama.” She said she mainly keeps her children inside. Some of the residents have criminal backgrounds, she said. Often there are children wandering around the complex with nothing to do. Payne-Bates said many of the residents feel trapped in the apartments and that they are treated like criminals for minor infractions. Though Perry thinks security is necessary in the complex, she agreed that the apartment management occasionally goes overboard. “They’re trying to implement rules that I don’t think are legal,” she said. She’s seen people get $50 tickets from management for sitting on the stairs or talking back to the security guards, she said. Barrett said many of the residents she interviewed don’t feel safe at Sycamore Villas and believe there was less violence and better police protection at Ripley Arnold. Their biggest concern was drugs, which Perry has noticed as well. She said many of her neighbors are trying to move to north Fort Worth, where they believe the schools are better and there is less crime. But school board president Kahan said that’s an exaggeration. He said he did not recall any major criminal incidents at North Crowley High. It’s hard to get crime statistics about individual neighborhoods, but recent Fort Worth police statistics do suggest that the area around Sycamore Center has a larger crime problem than some older neighborhoods. Over the past few months, for instance, the Sycamore School Road area had a much higher rate of both property and violent crimes than a similar-sized area around Eastchase Parkway. 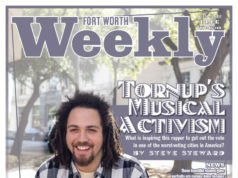 Tatum has been highly critical of Fort Worth police in the past, particularly over the death of Michael Jacobs Jr., a bipolar 24-year-old who died in April 2009 after being shocked with a Taser by a police officer for almost a full minute. Tatum is working with the police department to improve its strained relationship with the black community — and to improve what he sees as its tendency to criminalize poverty and mete out different kinds of justice to poor and wealthy citizens. Minority and civil rights leaders have met with Fort Worth Police Chief Jeff Halstead since the incident. Tatum said he believes the conversations have helped the police department realize the importance of diversity training. Fort Worth Police Lt. Paul Henderson, the department’s chief of staff, said the department has improved but is still working to strengthen its relationship with its community. 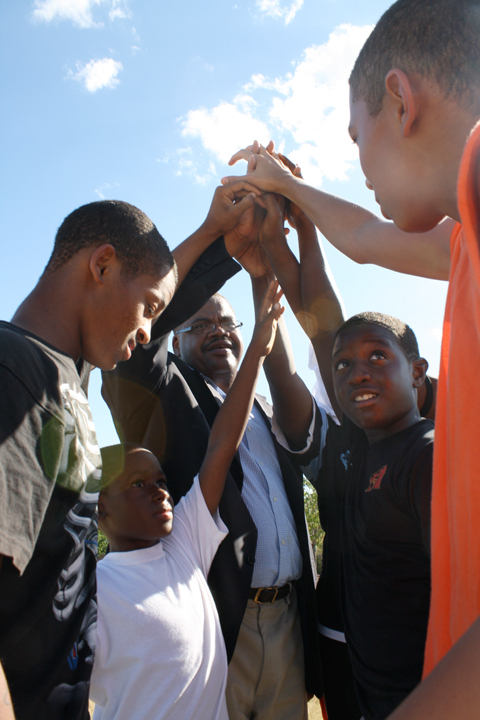 “The meetings have helped tremendously to reflect on where we were and establish where we need to focus — i.e., diversity recruitment and employment opportunities, employee retention, advanced training, MHMR services and other social assistance training, and overcoming barriers of mistrust within the community,” Henderson wrote in an e-mail. Henderson said his department does not recognize any area of town as more problematic than another when it comes to crime. However, Hector Carrillo, former director of the Fort Worth chapter of LULAC, said he tracks crime rates in various parts of the city and that poorer areas do tend to have higher rates of burglary and larceny. “I’m not saying it’s related to minorities. It’s related to poverty,” he said. First off, it is bad idea to lump people coming from poor, low-income areas together when seeking to improve their state. Every area, be it low-income, ghetto, or affluent are made up of people—most of them who have the same mindset or values. So it is people’s mentality you’re dealing with, not buildings. If you lump people with same mentality together–no matter where you put them, the same problems are going to follow them. Why not disburse low-income families looking to improve their state throughout the city in a “gradual” progression. In other words, instead of putting them in affluent neighborhoods where both those that come from the area and those who transition to the area literally experience “cultural shock”, why not put them in neighborhoods where they are reasonably safe from crime and can have access to social services that employ people they can relate to and where there is a chance for improving their lives. I can recall that in Washington, DC the city refurbished a large housing complex–putting in new apartments, a convenience store, a swimming pool, and other nice amenities. The apartments were offered on different levels; most for low- to moderate-income, and a small number for middle income and a number of units at the market rate. With 10 years, the place literally became a war zone. People from poor neighborhoods who had not moved into the newly-fixed complex would come over and hang out at the complex, soon crime spread throughout the complex and the place reverted back to the dump it was before refurbishing. So, I say, it’s the mentality of some of the folks who are seeking help. It’s true there are problems germane to such surroundings that need to be specially addressed. But, in the meantime, things often deteriorate faster than relief can be implemented. Ultimately, the affluent move out and you’re left with the same types of environment they moved out of in the first place. Sometimes, as the saying goes, “you can take a person out of the ghetto, but you can’t change the ghetto (mentality) in that person.” Unfortunately, most folk who are not used to dealing with the problems they bring and don’t want that type of drama in their neighborhoods.